"Franz Joseph" redirects here. For other uses, see Franz Joseph (disambiguation). 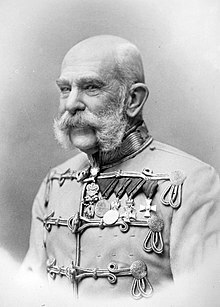 Franz Joseph I or Francis Joseph I (Franz Joseph Karl; 18 August 1830 – 21 November 1916) was Emperor of Austria, King of Hungary, and monarch of many other states of the Austro-Hungarian Empire, from 2 December 1848 to his death. From 1 May 1850 to 24 August 1866 he was also President of the German Confederation. He was the longest-reigning Emperor of Austria and King of Hungary, as well as the third-longest-reigning monarch of any country in European history, after Louis XIV of France and Johann II of Liechtenstein. In December 1848, Emperor Ferdinand abdicated the throne at Olomouc, as part of Minister President Felix zu Schwarzenberg's plan to end the Revolutions of 1848 in Hungary. This allowed Ferdinand's nephew Franz Joseph to accede to the throne. Largely considered to be a reactionary, Franz Joseph spent his early reign resisting constitutionalism in his domains. The Austrian Empire was forced to cede its influence over Tuscany and most of its claim to Lombardy–Venetia to the Kingdom of Piedmont-Sardinia, following the Second Italian War of Independence in 1859 and the Third Italian War of Independence in 1866. Although Franz Joseph ceded no territory to the Kingdom of Prussia after the Austrian defeat in the Austro-Prussian War, the Peace of Prague (23 August 1866) settled the German Question in favour of Prussia, which prevented the Unification of Germany from occurring under the House of Habsburg. Franz Joseph was troubled by nationalism during his entire reign. He concluded the Austro-Hungarian Compromise of 1867, which granted greater autonomy to Hungary and transformed the Austrian Empire into the Dual Monarchy of Austria-Hungary. He ruled peacefully for the next 45 years, but personally suffered the tragedies of the execution of his brother, the Emperor Maximilian of Mexico in 1867, the suicide of his only son and heir, Crown Prince Rudolf, in 1889, and the assassination of his wife, Empress Elisabeth, in 1898. After the Austro-Prussian War, Austria-Hungary turned its attention to the Balkans, which was a hotspot of international tension because of conflicting interests with the Russian Empire. The Bosnian Crisis was a result of Franz Joseph's annexation of Bosnia and Herzegovina in 1908, which had been occupied by his troops since the Congress of Berlin (1878). On 28 June 1914, the assassination of his nephew, Archduke Franz Ferdinand, in Sarajevo resulted in Austria-Hungary's declaration of war against the Kingdom of Serbia, which was Russia's ally. That activated a system of alliances which resulted in World War I.
Franz Joseph died on 21 November 1916, after ruling his domains for almost 68 years as one of the longest-reigning monarchs in modern history. He was succeeded by his grandnephew Charles. Franz Joseph was born in the Schönbrunn Palace in Vienna (on the 65th death anniversary of Francis of Lorraine), the eldest son of Archduke Franz Karl (the younger son of Holy Roman Emperor Francis II), and his wife Princess Sophie of Bavaria. Because his uncle, from 1835 the Emperor Ferdinand, was weak-minded, and his father unambitious and retiring, the young Archduke "Franzl" was brought up by his mother as a future Emperor with emphasis on devotion, responsibility and diligence. 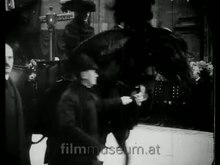 Franzl came to idolise his grandfather, der Gute Kaiser Franz, who had died shortly before the former's fifth birthday, as the ideal monarch. At the age of thirteen, Franzl started a career as a colonel in the Austrian army. From that point onward, his fashion was dictated by army style and for the rest of his life he normally wore the uniform of a military officer. Franz Joseph was soon joined by three younger brothers: Archduke Ferdinand Maximilian (born 1832, the future Emperor Maximilian of Mexico); Archduke Karl Ludwig (born 1833, father of Archduke Franz Ferdinand of Austria), and Archduke Ludwig Viktor (born 1842), and a sister, Maria Anna (born 1835), who died at the age of four. Following the resignation of the Chancellor Prince Metternich during the Revolutions of 1848, the young Archduke, who it was widely expected would soon succeed his uncle on the throne, was appointed Governor of Bohemia on 6 April, but never took up the post. Instead, Franz was sent to the front in Italy, joining Field Marshal Radetzky on campaign on 29 April, receiving his baptism of fire on 5 May at Santa Lucia. By all accounts he handled his first military experience calmly and with dignity. Around the same time, the Imperial Family was fleeing revolutionary Vienna for the calmer setting of Innsbruck, in Tyrol. Soon, the Archduke was called back from Italy, joining the rest of his family at Innsbruck by mid-June. It was at Innsbruck at this time that Franz Joseph first met his cousin Elisabeth, his future bride, then a girl of ten, but apparently the meeting made little impression. Following victory over the Italians at Custoza in late July, the court felt it safe to return to Vienna, and Franz Joseph travelled with them. But within a few months Vienna again appeared unsafe, and in September the court left once more, this time for Olomouc (Olmütz) in Moravia. By now, Prince Alfred I of Windisch-Grätz, an influential military commander in Bohemia, was determined to see the young Archduke soon put on the throne. It was thought that a new ruler would not be bound by the oaths to respect constitutional government to which Ferdinand had been forced to agree, and that it was necessary to find a young, energetic emperor to replace the kindly, but mentally unfit Ferdinand. By the abdication of his uncle Ferdinand and the renunciation of his father, the mild-mannered Franz Karl, Franz Joseph succeeded as Emperor of Austria at Olomouc on 2 December. At this time he first became known by his second as well as his first Christian name. The name "Franz Joseph" was chosen to bring back memories of the new Emperor's great-granduncle, Emperor Joseph II, remembered as a modernising reformer. Under the guidance of the new prime minister Prince Schwarzenberg the Third, the new emperor at first pursued a cautious course, granting a constitution in early 1849. At the same time, a military campaign was necessary against the Hungarians, who had rebelled against Habsburg central authority in the name of their ancient liberties. Franz Joseph was also almost immediately faced with a renewal of the fighting in Italy, with King Charles Albert of Sardinia taking advantage of setbacks in Hungary to resume the war in March 1849. However, the military tide began to swiftly turn in favor of Franz Joseph and the Austrian whitecoats. Almost immediately, Charles Albert was decisively beaten by Radetzky at Novara and forced to sue for peace, as well as to renounce his throne. In Hungary, the situation was more severe and Austrian defeat seemed imminent. Sensing a need to secure his right to rule, Franz Joseph sought help from Russia, requesting the intervention of Tsar Nicholas I, in order "to prevent the Hungarian insurrection developing into a European calamity". Russian troops entered Hungary in support of the Austrians and the revolution was crushed by late summer of 1849. With order now restored throughout his Empire, Franz Joseph felt free to renege on the constitutional concessions he had made, especially as the Austrian parliament meeting at Kremsier had behaved—in the young Emperor's eyes—abominably. The 1849 constitution was suspended, and a policy of absolutist centralism was established, guided by the Minister of the Interior, Alexander Bach. The next few years saw the seeming recovery of Austria's position on the international scene following the near disasters of 1848–1849. Under Schwarzenberg's guidance, Austria was able to stymie Prussian scheming to create a new German Federation under Prussian leadership, excluding Austria. After Schwarzenberg's premature death in 1852, he could not be replaced by statesmen of equal stature, and the Emperor himself effectively took over as prime minister. 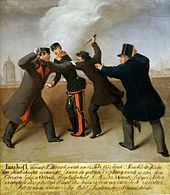 On 18 February 1853, Franz Joseph survived an assassination attempt by Hungarian nationalist János Libényi. The emperor was taking a stroll with one of his officers, Count Maximilian Karl Lamoral O'Donnell, on a city bastion, when Libényi approached him. He immediately struck the emperor from behind with a knife straight at the neck. Franz Joseph almost always wore a uniform, which had a high collar that almost completely enclosed the neck. The collars of uniforms at that time were made from very sturdy material, precisely to counter this kind of attack. Even though the Emperor was wounded and bleeding, the collar saved his life. Count O'Donnell struck Libényi down with his sabre. O'Donnell, hitherto only a Count by virtue of his Irish nobility (as a descendant of the Irish noble dynasty O'Donnell of Tyrconnell), was made a Count of the Habsburg Empire (Reichsgraf). Another witness who happened to be nearby, the butcher Joseph Ettenreich, swiftly overpowered Libényi. For his deed he was later elevated to the nobility by the Emperor and became Joseph von Ettenreich. Libényi was subsequently put on trial and condemned to death for attempted regicide. He was executed on the Simmeringer Heide. After this unsuccessful attack, the Emperor's brother Archduke Ferdinand Maximilian, later Emperor of Mexico, called upon Europe's royal families for donations to construct a new church on the site of the attack. The church was to be a votive offering for the survival of the Emperor. It is located on Ringstraße in the district of Alsergrund close to the University of Vienna, and is known as the Votivkirche. Franz Joseph's coronation as Apostolic King of Hungary. Painting by Edmund Tull. The 1850s witnessed several failures of Austrian external policy: the Crimean War, the dissolution of its alliance with Russia, and defeat in the Second Italian War of Independence. The setbacks continued in the 1860s with defeat in the Austro-Prussian War of 1866, which resulted in the Austro-Hungarian Compromise of 1867. Political difficulties in Austria mounted continuously through the late 19th century and into the 20th century. However, Franz Joseph remained immensely respected; the Emperor's patriarchal authority held the Empire together while the politicians squabbled among themselves. Franz Joseph in the regalia of the Order of the Golden Fleece, with the Bohemian Crown Jewels next to him. Painting by Eduard von Engerth for the Bohemian Diet, 1861. Following the accession of Franz Joseph to the throne in 1848, the political representatives of the Kingdom of Bohemia hoped and insisted that account should be taken of their historical state rights in the upcoming constitution. The autonomous position of Bohemia within the Habsburg Monarchy was to be expressed by the coronation of the new ruler to the king of Bohemia in Prague (the last coronation took place in 1836). "I will have myself crowned King of Bohemia in Prague, and I am convinced that a new, indissoluble bond of trust and loyalty between My throne and My Bohemian Kingdom will be strengthened by this holy rite." In contrast to his predecessor Emperor Ferdinand (who spent the rest of his life after his abdication in 1848 in Bohemia and especially in Prague), Franz Joseph was never crowned king of Bohemia. In 1861, the negotiations failed because of unsolved constitutional problems, and in 1866, a visit of the monarch to Prague following the defeat at Hradec Králové (Königgrätz) was also unsuccessful. In 1867, the Austro-Hungarian Compromise and the introduction of the dual monarchy left the Czechs and their aristocracy without the recognition of Bohemian state rights for which they had hoped. Instead of celebrating a coronation in Prague, they had to witness the coronation in Budapest (8 June 1867). In Bohemia, opposition to dualism took the form of street demonstrations, resolutions from district representations, and even open air mass protest meetings. The Czechs were disillusioned. According to the Czech newspaper Národní listy, the Czechs had not yet been compensated for their wartime losses and sufferings during the Austro-Prussian War, and had just seen their historic state rights tossed aside and their land subsumed into the "other" half of the Austro-Hungarian Monarchy, commonly called "Cisleithania". Having in mind the constitutional position of the Bohemian Crown and being conscious of the glory and power which that Crown has given us and our predecessors… we gladly recognise the rights of the kingdom and are prepared to renew that recognition through our coronation oath. For the planned coronation, the composer Bedřich Smetana had written the opera Libuše, but the ceremony did not take place. The creation of the German Empire, domestic opposition from German-speaking liberals (especially German-Bohemians) and from Hungarians doomed the Fundamental Articles. Hohenwart resigned and nothing changed. Whenever Franz Joseph visited Bohemia, he was greeted as the uncrowned Bohemian king rather than as the emperor, and the omnipresent decorations with depictions of the Crown of Saint Wenceslas reminded him of his unfulfilled promise of a coronation in Prague. Many Czech people were waiting for political changes in monarchy, including Tomáš Garrigue Masaryk and others. Masaryk served in the Reichsrat (Imperial Council) from 1891 to 1893 in the Young Czech Party and again from 1907 to 1914 in the Realist Party (which he had founded in 1900), but he did not campaign for the independence of Czechs and Slovaks from Austria-Hungary. In Vienna in 1909 he helped Hinko Hinković's defense in the fabricated trial against prominent Croats and Serbs members of the Serbo-Croatian Coalition (such as Frano Supilo and Svetozar Pribićević), and others, who were sentenced to more than 150 years and a number of death penalties. The Czech question would remain unresolved for the entirety of Franz Joseph's political career. The main foreign policy goal of Franz Joseph had been the unification of Germany under the House of Habsburg. This was justified on grounds of precedence; from 1452 to the end of the Holy Roman Empire in 1806, with only one period of interruption under the Wittelsbachs, the Habsburgs had generally held the German crown. However, Franz Joseph's desire to retain the non-German territories of the Habsburg Austrian Empire in the event of German unification proved problematic. 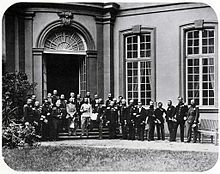 Two factions quickly developed: a party of German intellectuals favouring a Greater Germany (Großdeutschland) under the House of Habsburg; the other favouring a Lesser Germany (Kleindeutschland). The Greater Germans favoured the inclusion of Austria in a new all-German state on the grounds that Austria had always been a part of Germanic empires, that it was the leading power of the German Confederation, and that it would be absurd to exclude eight million Austrian Germans from an all-German nation state. The champions of a lesser Germany argued against the inclusion of Austria on the grounds that it was a multi-nation state, not a German one, and that its inclusion would bring millions of non-Germans into the German nation state. If Greater Germany was to prevail, the crown would necessarily have to go to Franz Joseph, who had no desire to cede it in the first place to anyone else. On the other hand, if the idea of a smaller Germany won out, the German crown could of course not possibly go the Emperor of Austria, but would naturally be offered to the head of the largest and most powerful German state outside of Austria—the King of Prussia. The contest between the two ideas, quickly developed into a contest between Austria and Prussia. After Prussia decisively won the Seven Weeks War, this question was solved; Austria lost no territories as long as they remained out of German affairs. 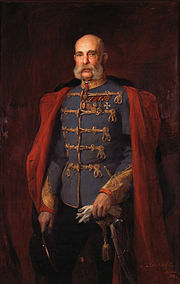 Franz Joseph's German identity was made explicitly clear during a meeting in August 1908 between himself and Edward VII when the latter tried to persuade him to abandon Austria-Hungary's alliance with Germany for co-operation with England; Franz Joseph replied that he was a "loyal ally" and said "I am a German prince." In 1873, two years after the unification of Germany, Franz Joseph entered into the League of Three Emperors (Dreikaiserbund) with Kaiser Wilhelm I of Germany and Tsar Alexander II of Russia, who was succeeded by Tsar Alexander III in 1881. The league had been designed by the German chancellor Otto von Bismarck, as an attempt to maintain the peace of Europe. It would last intermittently until 1887. In 1903, Franz Joseph's veto of Cardinal Mariano Rampolla's election to the papacy was transmitted to the Papal conclave by Cardinal Jan Puzyna de Kosielsko. It was the last use of such a veto, as the new Pope Pius X prohibited future uses and provided for excommunication for any attempt. During the mid-1870s a series of violent rebellions against Ottoman rule broke out in the Balkans, and the Turks responded with equally violent and oppressive reprisals. Tsar Alexander II of Russia, wanting to intervene against the Ottomans, sought and obtained an agreement with Austria-Hungary. In the Budapest Conventions of 1877, the two powers agreed that Russia would annex Bessarabia, and Austria-Hungary would observe a benevolent neutrality toward Russia in the pending war with the Turks. As compensation for this support, Russia agreed to Austria-Hungary's annexation of Bosnia-Herzegovina. A scant 15 months later, the Russians imposed on the Ottomans the Treaty of San Stefano, which reneged on the Budapest accord and declared that Bosnia-Herzegovina would be jointly occupied by Russian and Austrian troops. The treaty was overturned by the 1878 Treaty of Berlin, which allowed sole Austrian occupation of Bosnia-Herzegovina but did not specify a final disposition of the provinces. [clarification needed] That omission was addressed in the Three Emperors' League agreement of 1881, when both Germany and Russia endorsed Austria's right to annex Bosnia-Herzegovina. However, by 1897, under a new tsar, the Russian Imperial government had again withdrawn its support for Austrian annexation of Bosnia-Herzegovina. The Russian foreign minister, Count Michael Muraviev, stated that an Austrian annexation of Bosnia-Herzegovina would raise "an extensive question requiring special scrutiny". In 1908, the Russian foreign minister, Alexander Izvolsky, offered Russian support, for the third time, for the annexation of Bosnia and Herzegovina by Austria-Hungary, in exchange for Austrian support for the opening of the Bosporus Strait and the Dardanelles to Russian warships. Austria's foreign minister, Alois von Aehrenthal, pursued this offer vigorously, resulting in the quid pro quo understanding with Izvolsky, reached on 16 September 1908 at the Buchlau Conference. However, Izvolsky made this agreement with Aehrenthal without the knowledge of Tsar Nicholas II or his government in St. Petersburg, or any of the other foreign powers including Britain, France and Serbia. Based upon the assurances of the Buchlau Conference and the treaties that preceded it, Franz Joseph signed the proclamation announcing the annexation of Bosnia-Herzegovina into the Empire on 6 October 1908. However a diplomatic crisis erupted, as both the Serbs and the Italians demanded compensation for the annexation, which the Austro-Hungarian government refused to entertain. The incident was not resolved until the revision of the Treaty of Berlin in April 1909, exacerbating tensions between Austria-Hungary and the Serbs. On 28 June 1914 Franz Joseph's nephew and heir Archduke Franz Ferdinand, and his morganatic wife Sophie, Duchess of Hohenberg, were assassinated by Gavrilo Princip, a Yugoslav nationalist of Serbian ethnicity, during a visit to Sarajevo. When he heard the news of the assassination, Franz Joseph said that "one has not to defy the Almighty. In this manner a superior power has restored that order which I unfortunately was unable to maintain." While the emperor was shaken, and interrupted his holiday to return to Vienna, he soon resumed his vacation at his imperial villa at Bad Ischl. Initial decision-making during the "July Crisis" fell to Count Leopold Berchtold, the Austrian foreign minister; Count Franz Conrad von Hötzendorf, the chief of staff for the Austro-Hungarian army and the other ministers. The ultimate resolution of deliberations by the Austrian government during the weeks following the assassination of the Archduke was to give Serbia an ultimatum of itemized demands with which it was virtually certain Serbia would be unable or unwilling to comply, thus serving as a "legal basis for war." However, the general movement toward war with Serbia was already in motion prior to assassination of the Archduke as evidenced by a 14 June memo of Berchtold recommending the "elimination of Serbia" as a state, which Franz Josef expressed agreement with in a letter delivered to Kaiser Wilhelm II in Berlin on 5 July. In that letter, Franz Josef "...explicitly stated that the decision for war against Serbia had been made before the assassination of the Archduke, and that the events of Sarajevo only confirmed the already pre-existing need for a war." A week after delivery of the Austrian ultimatum to Serbia, on 28 July, Austria-Hungary declared war on Serbia. Within weeks, the Germans, Russians, French and British had all entered the fray which eventually became known as World War I. On 6 August, Franz Joseph signed the declaration of war against Russia. Franz Joseph died in the Schönbrunn Palace on the evening of 21 November 1916, at the age of 86. His death was a result of developing pneumonia of the right lung several days after catching a cold while walking in Schönbrunn Park with the King of Bavaria. He was succeeded by his grandnephew Charles I, who reigned until the collapse of the Empire following its defeat in 1918. He is buried in the Imperial Crypt in Vienna, where flowers are still left by monarchists. It was generally felt in the court that the Emperor should marry and produce heirs as soon as possible. Various potential brides were considered: Princess Elisabeth of Modena, Princess Anna of Prussia and Princess Sidonia of Saxony. Although in public life Franz Joseph was the unquestioned director of affairs, in his private life his formidable mother still wielded crucial influence. 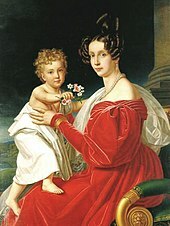 Sophie wanted to strengthen the relationship between the Houses of Habsburg and Wittelsbach—descending from the latter house herself—and hoped to match Franz Joseph with her sister Ludovika's eldest daughter, Helene ("Néné"), who was four years the Emperor's junior. However, Franz Joseph fell deeply in love with Néné's younger sister Elisabeth ("Sisi"), a beautiful girl of fifteen, and insisted on marrying her instead. 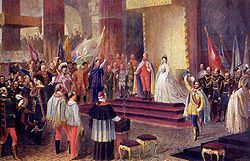 Sophie acquiesced, despite her misgivings about Sisi's appropriateness as an imperial consort, and the young couple were married on 24 April 1854 in St. Augustine's Church, Vienna. Their marriage would prove to be an unhappy one; though Franz Joseph was passionately in love with his wife, as the feeling was not mutual. Sisi never truly acclimatized to life at court, and was frequently in conflict with the imperial family. Their first daughter Sophie died as an infant, and their only son Rudolf died by suicide in 1889 in the infamous Mayerling Incident. In 1885 Franz Joseph met Katharina Schratt, a leading actress of the Vienna stage, and she became his friend and confidante. This relationship lasted the rest of his life, and was—to a certain degree—tolerated by Sisi. Franz Joseph built Villa Schratt in Bad Ischl for her, and also provided her with a small palace in Vienna. Though their relationship lasted for thirty-four years, it remained platonic. The Empress was an inveterate traveller, horsewoman, and fashion maven who was rarely seen in Vienna. Sisi was obsessed about preserving her beauty, carrying out many bizarre routines and strenuous exercise, and as a result suffered from ill health. She was stabbed to death by an Italian anarchist in 1898 while on a visit to Geneva. A few days after the funeral, Robert of Parma wrote in a letter to his friend Tirso de Olazábal that "It was pitiful to look at the Emperor, he showed a great deal of energy in his immense pain, but at times one could see all the immensity of his grief." Franz Joseph never fully recovered from the loss. According to the future empress Zita of Bourbon-Parma he told his relatives: "You'll never know how important she was to me" or, according to some sources, "You will never know how much I loved this woman." Archduke Franz Ferdinand became heir presumptive (Thronfolger) to the throne of Austria-Hungary in 1896, after the deaths of his cousin Rudolf (in 1889) and his father Karl Ludwig. The relationship between him and Franz Joseph had always been a fairly contentious one, which was further exacerbated when Franz Ferdinand announced his desire to marry Countess Sophie Chotek, a match that was out of the question in the mind of the emperor, as Sophie was merely of nobility as opposed to being of dynastic rank. Although the emperor received letters from members of the imperial family throughout the fall and winter of 1899 importuning him to relent, Franz Joseph stood his ground. He finally gave his consent in 1900; however, the marriage was to be morganatic and any children of the marriage would be ineligible to succeed to the throne. The couple were married on 1 July 1900 at Reichstadt. The emperor did not attend the wedding, nor did any of the archdukes. After that, the two men disliked and distrusted each other. Following the assassination of Franz Ferdinand and Sophie in 1914, Franz Joseph's daughter, Marie Valerie, noted that her father expressed his greater confidence in the new heir presumptive: his grandnephew Archduke Charles. The emperor admitted to his daughter, regarding the assassination: "For me, it is a relief from a great worry." 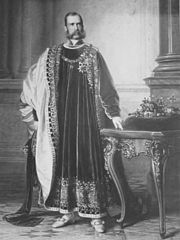 His official grand title after the Ausgleich of 1867 was: "Francis Joseph the First, by the Grace of God Emperor of Austria, Apostolic King of Hungary, King of Bohemia, King of Dalmatia, Croatia, Slavonia, Galicia and Lodomeria and Illyria; King of Jerusalem etc., Archduke of Austria; Grand Duke of Tuscany and Cracow, Duke of Lorraine, of Salzburg, Styria, Carinthia, Carniola and of Bukovina; Grand Prince of Transylvania; Margrave of Moravia; Duke of Upper and Lower Silesia, of Modena, Parma, Piacenza and Guastalla, of Oświęcim, Zator and Ćeszyn, Friuli, Ragusa (Dubrovnik) and Zara (Zadar); Princely Count of Habsburg and Tyrol, of Kyburg, Gorizia and Gradisca; Prince of Trent (Trento) and Brixen; Margrave of Upper and Lower Lusatia and in Istria; Count of Hohenems, Feldkirch, Bregenz, Sonnenberg, etc. ; Lord of Trieste, of Cattaro (Kotor), and over the Windic march; Grand Voivode of the Voivodship of Serbia." In addition, he founded the Order of Franz Joseph (Franz Joseph-Orden) in 1849, and the Order of Elizabeth (Elizabeth-Orden) in 1898. Franz Josef Land in the Russian Arctic was named in his honour in 1873 by the Austro-Hungarian North Pole expedition which first reported finding it. The Franz Josef Glacier in New Zealand's South Island also bears his name. Franz Joseph founded in 1872 the Franz Joseph University (Hungarian: Ferenc József Tudományegyetem, Romanian: Universitatea Francisc Iosif) in the city of Cluj-Napoca (at that time a part of Austria-Hungary under the name of Kolozsvár). The university was moved to Szeged after Cluj became a part of Romania, becoming the University of Szeged. In certain areas, celebrations are still being held in remembrance of Franz Joseph's birthday. The Mitteleuropean People's Festival takes place every year around 18 August, and is a "spontaneous, traditional and brotherly meeting among peoples of the Central-European Countries". The event includes ceremonies, meetings, music, songs, dances, wine and food tasting, and traditional costumes and folklore from Mitteleuropa. "With united forces" (as the Emperor of Austria) – German: "Mit vereinten Kräften" – Latin: "Viribus Unitis"
"My trust in [the ancient] virtue" (as the Apostolic King of Hungary) – Hungarian: "Bizalmam az Ősi Erényben" – Latin: "Virtutis Confido"
Franc Jozeph Island, island in Albania named in honor of the Emperor. ^ Murad 1968, p. 1. ^ "Gale Encyclopedia of Biography: ''Francis Joseph''". Answers.com. Retrieved 2 December 2013. ^ Murad 1968, p. 61. ^ Murad 1968, p. 101. ^ Murad 1968, p. 33. ^ Murad 1968, p. 8. ^ Murad 1968, p. 6. ^ a b Murad 1968, p. 41. ^ a b c Murad 1968, p. 42. ^ Decker, Wolfgang. "Kleingartenanlage Simmeringer Haide". www.simmeringerhaide.at. Retrieved 4 October 2018. ^ Murad 1968, p. 169. ^ a b c d Le Caine Agnew, Hugh (2007). "The Flyspecks on Palivec's Portrait: Franz Joseph, the Symbols of Monarchy, and Czech Popular Loyalty". In Cole, Laurence; Unowsky, Daniel L. (eds.). The limits of loyalty : imperial symbolism, popular allegiances, and state patriotism in the late Habsburg monarchy. New York: Berghahn Books. pp. 86–112. ISBN 9781845452025. Retrieved 17 November 2016. ^ Murad 1968, p. 149. ^ Murad 1968, p. 150. ^ a b c Murad 1968, p. 151. ^ a b Murad 1968, p. 127. ^ a b Albertini 2005, p. 16. ^ Albertini 2005, p. 37. ^ Dejan Djokić (January 2003). Yugoslavism: Histories of a Failed Idea, 1918–1992. C. Hurst & Co. Publishers. p. 24. ISBN 978-1-85065-663-0. ^ Palmer 1994, p. 328. ^ "Sausalito News 25 November 1916 — California Digital Newspaper Collection". Cdnc.ucr.edu. 25 November 1916. Retrieved 2 December 2013. ^ Murad 1968, p. 242. ^ a b Murad 1968, p. 120. ^ Morton, Frederic (1989). Thunder at Twilight: Vienna 1913/1914. pp. 85–86. ^ Murad 1968, p. 117. ^ Palmer 1994, p. 288. ^ Palmer 1994, p. 289. ^ Palmer 1994, p. 324. ^ a b Wurzbach, Constantin, von, ed. (1860). "Habsburg, Franz Karl Joseph" . Biographisches Lexikon des Kaiserthums Oesterreich [Biographical Encyclopedia of the Austrian Empire] (in German). 6. p. 257 – via Wikisource. ^ a b Wurzbach, Constantin, von, ed. (1861). "Habsburg, Sophie (geb. 27. Jänner 1805)" . Biographisches Lexikon des Kaiserthums Oesterreich [Biographical Encyclopedia of the Austrian Empire] (in German). 7. p. 149 – via Wikisource. ^ a b Wurzbach, Constantin, von, ed. (1860). "Habsburg, Franz I." . Biographisches Lexikon des Kaiserthums Oesterreich [Biographical Encyclopedia of the Austrian Empire] (in German). 6. p. 208 – via Wikisource. ^ a b Wurzbach, Constantin, von, ed. (1861). "Habsburg, Maria Theresia von Neapel" . Biographisches Lexikon des Kaiserthums Oesterreich [Biographical Encyclopedia of the Austrian Empire] (in German). 7. p. 81 – via Wikisource. ^ a b c d e f Genealogie ascendante jusqu'au quatrieme degre inclusivement de tous les Rois et Princes de maisons souveraines de l'Europe actuellement vivans [Genealogy up to the fourth degree inclusive of all the Kings and Princes of sovereign houses of Europe currently living] (in French). Bourdeaux: Frederic Guillaume Birnstiel. 1768. p. 94. ^ a b "Karoline Friederike Wilhelmine Königin von Bayern". Haus der Bayerischen Geschichte [House of Bavarian History] (in German). Bavarian Ministry of State for Wissenschaft and Kunst. Retrieved 30 November 2018. ^ a b c d Wurzbach, Constantin, von, ed. (1861). "Habsburg, Maria Theresia (deutsche Kaiserin)" . Biographisches Lexikon des Kaiserthums Oesterreich [Biographical Encyclopedia of the Austrian Empire] (in German). 7. p. 60 – via Wikisource. ^ a b Wurzbach, Constantin, von, ed. (1861). "Habsburg, Maria Ludovica (deutsche Kaiserin)" . Biographisches Lexikon des Kaiserthums Oesterreich [Biographical Encyclopedia of the Austrian Empire] (in German). 7. p. 53 – via Wikisource. ^ a b Genealogie ascendante jusqu'au quatrieme degre inclusivement de tous les Rois et Princes de maisons souveraines de l'Europe actuellement vivans [Genealogy up to the fourth degree inclusive of all the Kings and Princes of sovereign houses of Europe currently living] (in French). Bourdeaux: Frederic Guillaume Birnstiel. 1768. p. 9. ^ a b Genealogie ascendante jusqu'au quatrieme degre inclusivement de tous les Rois et Princes de maisons souveraines de l'Europe actuellement vivans [Genealogy up to the fourth degree inclusive of all the Kings and Princes of sovereign houses of Europe currently living] (in French). Bourdeaux: Frederic Guillaume Birnstiel. 1768. p. 38. ^ a b Genealogie ascendante jusqu'au quatrieme degre inclusivement de tous les Rois et Princes de maisons souveraines de l'Europe actuellement vivans [Genealogy up to the fourth degree inclusive of all the Kings and Princes of sovereign houses of Europe currently living] (in French). Bourdeaux: Frederic Guillaume Birnstiel. 1768. p. 69. ^ The official title of the ruler of Austrian Empire and later the Austria-Hungary had been changed several times: by a patent from 1 August 1804, by a court office decree from 22 August 1836, by an imperial court ministry decree from 6 January 1867 and finally by a letter from 12 December 1867. Shorter versions were recommended for official documents and international treaties: "Emperor of Austria, King of Bohemia etc. and Apostolic King of Hungary", "Emperor of Austria and Apostolic King of Hungary", "His Majesty The Emperor and King" and "His Imperial and Royal Apostolic Majesty". The term Kaiserlich und königlich (K.u.K.) was decreed in a letter from 17 October 1889 for the military, the navy and the institutions shared by both parts of the monarchy. – From the Otto's encyclopedia (published during 1888–1909), subject 'King', online in Czech. ^ Jørgen Pedersen (2009). Riddere af Elefantordenen, 1559–2009 (in Danish). Syddansk Universitetsforlag. p. 472. ISBN 978-87-7674-434-2. ^ (in Dutch) Military William Order: Franz Joseph I. Retrieved 9 maart 2016. ^ 100. Todestag Kaiser Franz Joseph (100th Anniversary of the death of Emperor Francis Joseph). The stamp uses the design issued on his 80th birthday, which in turn is based on a 1908 design by Koloman Moser to commemorate the 60th anniversary of his accession to the throne. Albertini, Luigi (2005). The Origins of the War of 1914. New York, NY: Enigma Books. Murad, Anatol (1968). Franz Joseph I of Austria and his Empire. Twayne Publishers. ISBN 978-0-8290-0172-3. Palmer, Alan (1994). Twilight of the Habsburgs: the Life and Times of Emperor Francis Joseph. Atlantic Monthly Press. Bagger, E. S. (1927). Francis Joseph: Emperor of Austria—King of Hungary. New York: G.P. Putnam's Sons. OCLC 1658401. Beller, S. (1996). Francis Joseph. Profiles in Power. London: Longman. OCLC 605339010. Bled, J. (1994). Franz Joseph. Oxford: Blackwell. OCLC 844302638. Cunliffe-Owen, M. (1904). A Keystone of Empire: Francis Joseph of Austria. New York: Harper. OCLC 8393894. Gerő, A. (2001). Emperor Francis Joseph: King of the Hungarians. Boulder: Social Science Monogaphs. OCLC 865200178. Owens, K. (2013). Franz Joseph and Elisabeth: The Last Great Monarchs of Austria-Hungary. Jefferson: McFarland & Company. ISBN 9781476612164. Redlich, J. (1929). Emperor Francis Joseph of Austria. New York: Macmillan. OCLC 936201260. Unterreiner, K. (2006). Emperor Franz Joseph, 1830–1916: Myth and Truth. Vienna: Brandstätter. ISBN 9783902510440. Van der Kiste, J. (2005). Emperor Francis Joseph: Life, Death and the Fall of the Habsburg Empire. Stroud: History Press. ISBN 9780752495477. Winkelhofer, M. (2012). The Everyday Life of the Emperor: Francis Joseph and His Imperial Court. Innsbruck: Haymon Taschenbuch. ISBN 9783852189277. This page was last edited on 21 April 2019, at 22:35 (UTC).